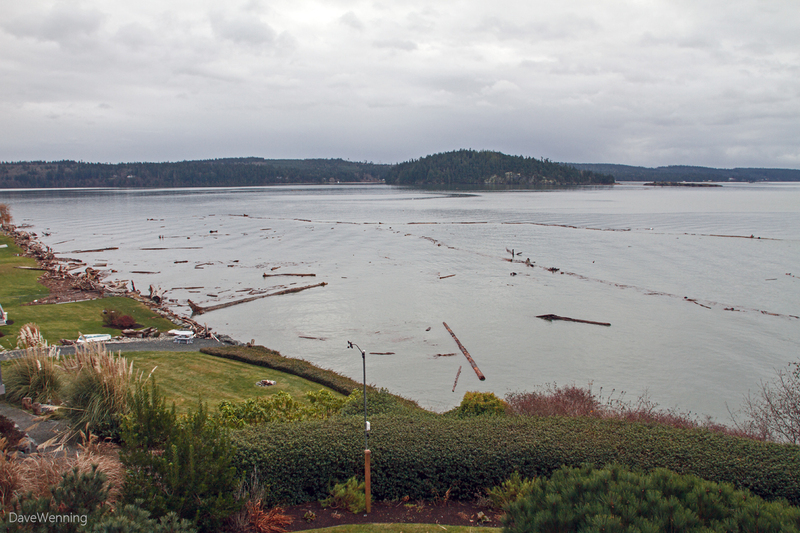 After all of the dire warnings, last night's windstorm turned out to be rather average on South Fidalgo Island. We didn't even lose power. Nobody is complaining, of course, it's just that this was one of the locations predicted to be hit the hardest. How these storms affect a particular spot can be highly variable. It depends to a large extent on the specific course the storm takes and the geography of the area. My weather station recorded a peak wind speed of 34 mph (55 kph or 29.5 knots) at 15 feet (4.6 m) off the ground. That is a significant wind speed, but not the 65 mph that was predicted. Today, the wind has literally been dead calm. The photo above was taken at about 9:30 AM, just before high tide. It looks like a lot of driftwood and debris was shaken loose by storm and it is now washing in with the tide. Most of this comes from the flooding Skagit River. It flows into the bay about 5 miles (8 km) to the southeast. It then comes swirling up with the tides and collects on the beaches here. There are Tidelines revealed where strings of debris have formed. They will disappear shortly after high tide. 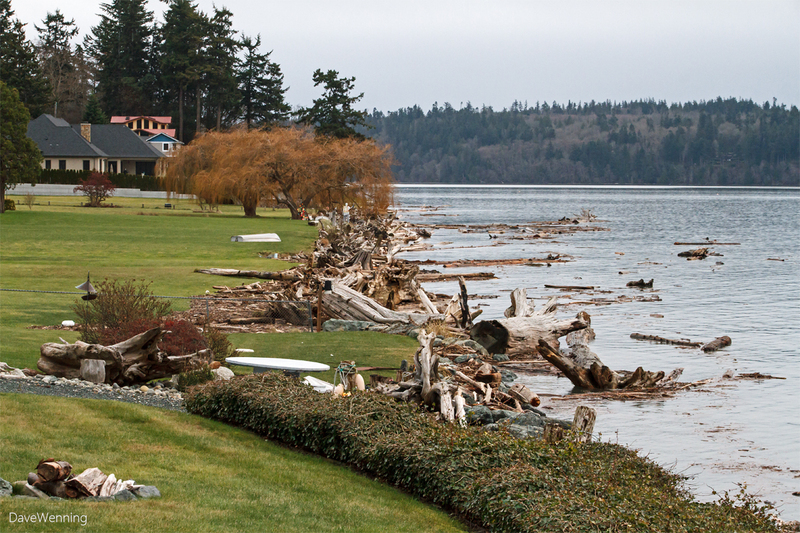 When storms hit during high tides, the driftwood can get washed up onto front lawns along the shoreline. Near the foreground, driftwood has even been kicked up over the riprap sea wall. 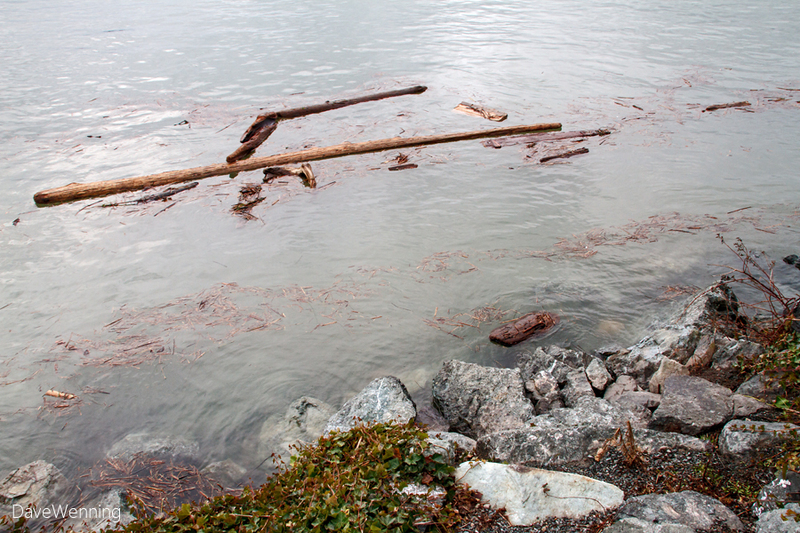 Driftwood that accumulates along a shoreline is actually an asset. It provides soft armoring against future storm surges, helps prevent beach erosion, offers nesting sites, a food source and cover for wildlife and leaches valuable organic nutrients into the sea water. This is a closer view of the spot I mentioned in the previous post. There was once a driftwood field here. It was built of large logs, roots and debris. Birds nested in it and native dune grasses grew up between the logs. The new owners tried to get rid of it and replace it with lawn. As you can see, nature has a different plan for this site. The storm delivered only minor windfall in my yard. My rhododendrons have taken a beating from falling limbs over the years. 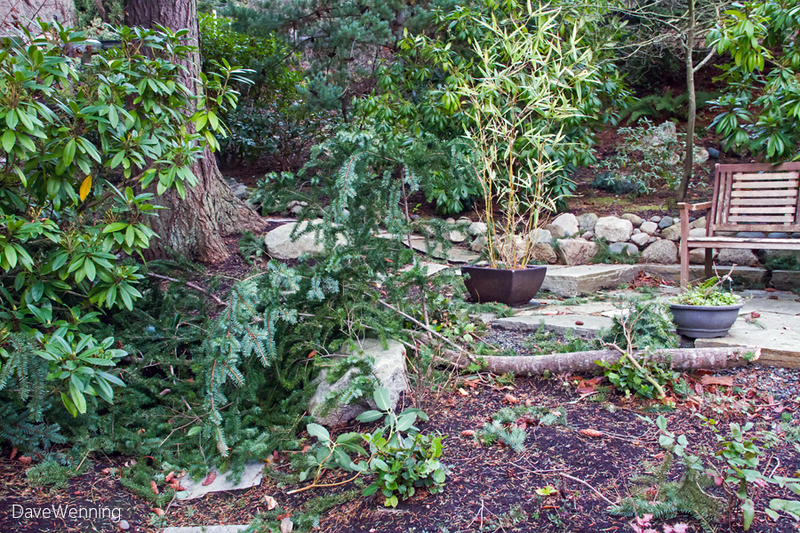 The shade garden took a hit (left). More windfall landed in the wooded strip between the neighbor's yard and mine (right). 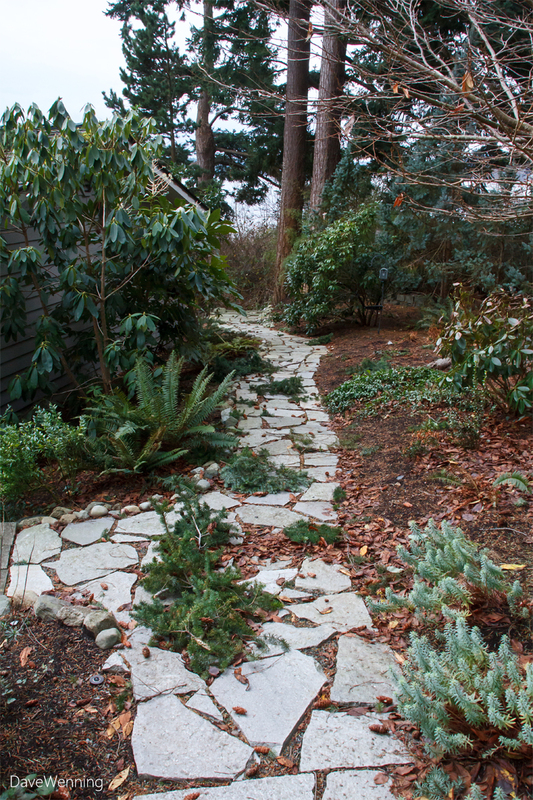 These are some of the "plants" growing in my back yard, and what attracted me to the property. Many would have cut them all down, but that was not my vision. Each one of them is a friend. 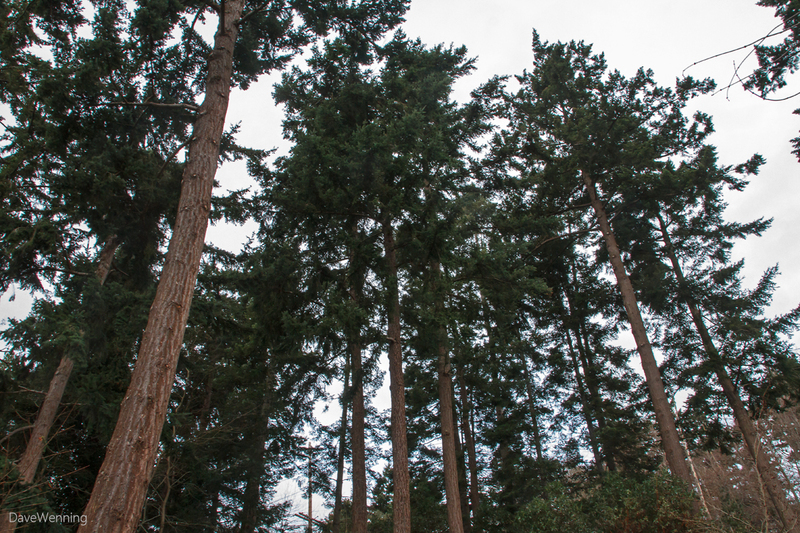 These Douglas and Grand Firs have been designed by evolution to withstand our windstorms. To protect themselves, they will give up some of their limbs to the wind, then heal the wounds. Natural movements in the wind stimulate the trees to add wood to week areas, called reaction wood. 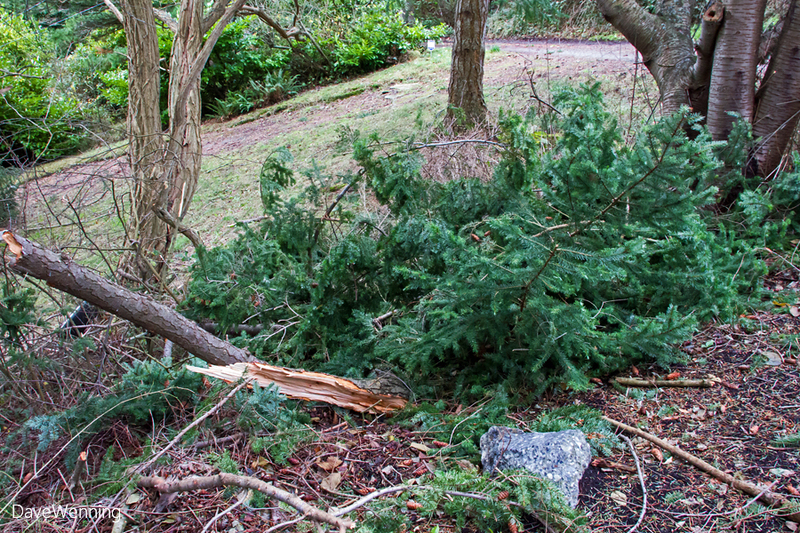 When trees blow down in the wind, it is usually because excess ground water has destabilized the anchoring of the roots. Assuring good drainage is important for preventing this. This is my beach access this morning during high tide. At just under 10 feet, the tide has overtopped the sea wall. In two weeks, we will be experiencing what are knows as king tides, the highest tides of the year. These will be 12 foot tides, two feet higher than what you see in the photos. 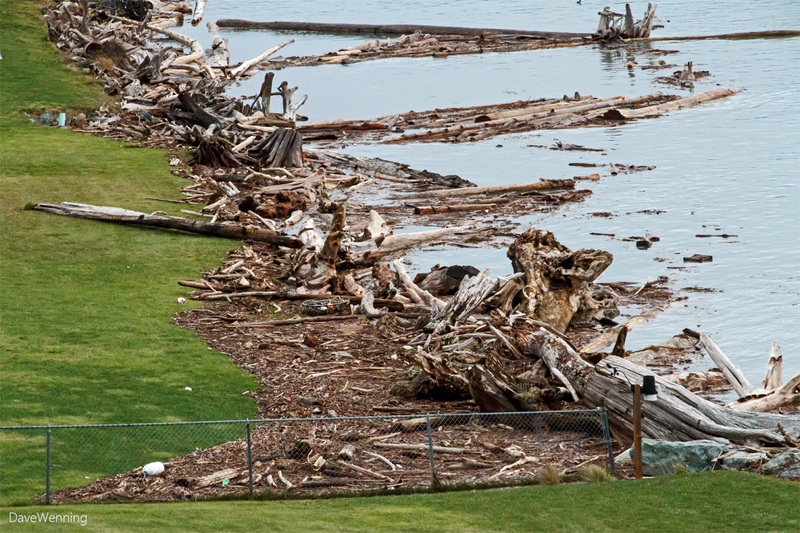 If these occur during windstorms, there can be major effects on shoreline properties. December 25th at 8:05 am, 26th at 8:48 am and 27th at 9:32 am are the dates and times of the upcoming king tides for Yokeko Point. I plan to run over to Ala Spit, a low sandbar on Whidbey Island to view and photograph them. All things considered, we got through yesterday's storm in good order. Even the power stayed on which is unusual for this neighborhood. The sun has come out this afternoon giving us a very pleasant day. It is perfect weather for my next chore, cleaning up all the debris that fell in the yard.